An Irish historical murder mystery of love, revenge and redemption, perfect for fans of Murder in an Irish Village by Carlene O’Connor and The Irish Inheritance by M.J Lee. The consequences of that bitter division in the 1920s carried down into Jo’s own life, shattering her relationship with Rory O’Donovan, the only man she ever loved, and driving her to leave Ireland, swearing she’d never return. Was her great-uncle really murdered by Dan O’Donovan, his best friend? What would drive somebody to do that? And what part did her beloved grandmother play in this conflict? Jo happy life in San Francisco has been unravelling since her friend Richard died last year. So now, much to her own surprise, she decides to stay on in Mucknamore and see if the letters and diaries bequeathed by her mother might provide the key to unlock the truth. And to understand how the consequences of a cold-blooded murder are still ricocheting down through the generations. She draws close again to Rory, who still lives in Mucknamore and is mired in an unhappy marriage. As she tells him about their shared family past, they realize their love affair was doomed long before they were born. Now that they know, can there be a second chance at happiness? Rory is urging her to rebel, to forget the past and start over again. But reading their shared history has made Jo cautious. The strength of her feelings frightens her. She has learned how the passion of rebellion sweeps people up but what happens after the rising? Is there any way she can be true to Rory and herself, but also to the family she rejected when she was young and headstrong? Is it possible that her mission to uncover the past might somehow reclaim the love that was lost to them all? 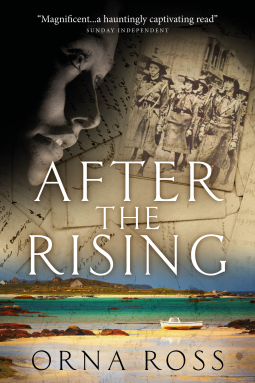 After The Rising is a sweeping, multigenerational tale set in the 1920s and 1990s Ireland and 1980s San Francisco. It is the first book in The Irish Trilogy, followed by Before the Fall.